Thread: Why wont you breed! Hey everyone, so I have 2 pairs going, 2 special projects and that's it this season.. only problem is, I've been pairing them since early September and so far, nothing. While I paired beginning of Sept, I started gradually lowering temps from 82-83f ambient & cool side, down to where it is now at about 74-75f. I only take the males out every now and then to feed the females, give them a brief rest and then I pair again. Food intake/offers are much lower now but I didn't want to eliminate food completely. It's frustrating because I see so many posts on FB where people are having instant courting upon introduction on the male and everything.... not sure what I am doing wrong. I even tried putting the leopard male into the other breeding group enclosure to see if that would get both males more motivated even when the leopard was pulled... no luck. Thoughts, advice? What can I do? these are 2 very special projects to me and it's basically my first season so any help would be extremely appreciated. Re: Why wont you breed! than aroused) Maybe beginning of Sept. was just too early? Maybe they both have a headache...? I agree with Noelle, those questions would help. I usually leave them alone - I mean completely alone. Just for a while but I've never had a male not want to do the deed or a female that did not accept the male. Do they have hides in the cages? Sometimes one of them will hide on the other one, if they don't have anywhere to hide, they might cuddle up together and twist tails! Haha yes, I just now saw your post, sorry! They do seem to be of good breeding age. Do you ever catch them coiled up together? I didn't think one of my pairs would breed until I walked into the room and happened to look into the cage and caught them right in the middle of it! Super exciting. Don't lose hope! She might just make him really earn her! I do regular check ins, and have found both pairs coiled up together from time to time. So maybe it's just the females playing hard to get lol. I also noticed that when I pair them, they spray urates everywhere.. like one enclosure looks like one of them smeared it on the back wall a few inches up. Is that a good sign? releasing pheromones or something? That's a good sign that they coil together. I'm unsure of the urates, I can't recall if mine ever did - if they did I did not notice at all. You should be good to go, some take longer some right away. Awesome, and yeah the urates thing is a mystery to me too. The boas that are on their own don't do that. They only urate once in a blue moon or when they poop. So, who knows. That's interesting Richy, did they end up producing? crazy, every summer lots of live healthy rosies. I suspect they prefer the dark of night, & when we're not gawking at them, lol. SpaceLizard and Richyboa72 like this. Good luck! Play some Marvin Gaye, light some candles, set the mood! Noelle7206, SpaceLizard and Richyboa72 like this. I caught the male and female locked up Nov 10th. I presume they were breeding stealthy and had been going at it before and maybe a while after. Heres where it gets crazy... The female went into shed cycle immediately and left blue around the same time that another female named Nibiru, also paired with a male, had her POS Dec 14th. Thing is I found Nibirus shed but not the Coral Sunglow Motleys. So either I missed it somehow while cleaning or she just left blue around dec 14th and didnt shed. Weird. Ok so fast forward to now, 3 days ago she had a very small and wet stool and I cleaned it up thinking nothing of it. Then today I went in and she was constricting her muscles above her vent and was pushing something out. She had already let out this realllllllly wet, slimy urate pool. So I watched her push this thing out, really weird looking poop, over 25 mins or so. Ever since that first little poop 3 days ago and now that, she has been pacing like crazy and is very restless. However, both pairs were together from very early Sept to Early Jan. So she couldve ovulated and been bred much sooner, maybe late Sept if he was really quick or late Oct, shed which was the real POS and I thought nothing of it because shes already big, then as she got bigger she shed again, missed it and thought that was the POS. That would put her due date around now I think. That make sense? 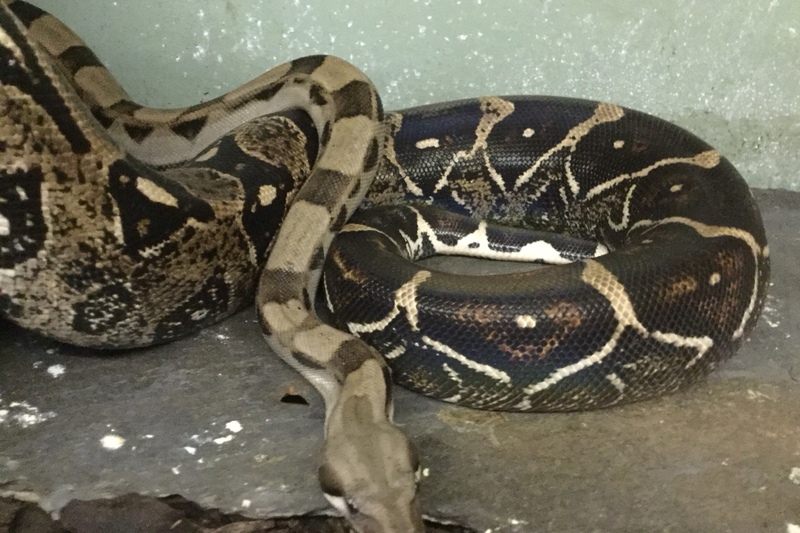 [Behavior] Dumerils Boa wont eat , and Rosey Boa wont eat PLEASE HELP!!! To breed or not to breed. Opinions needed. Ever have a girl that just wont breed?